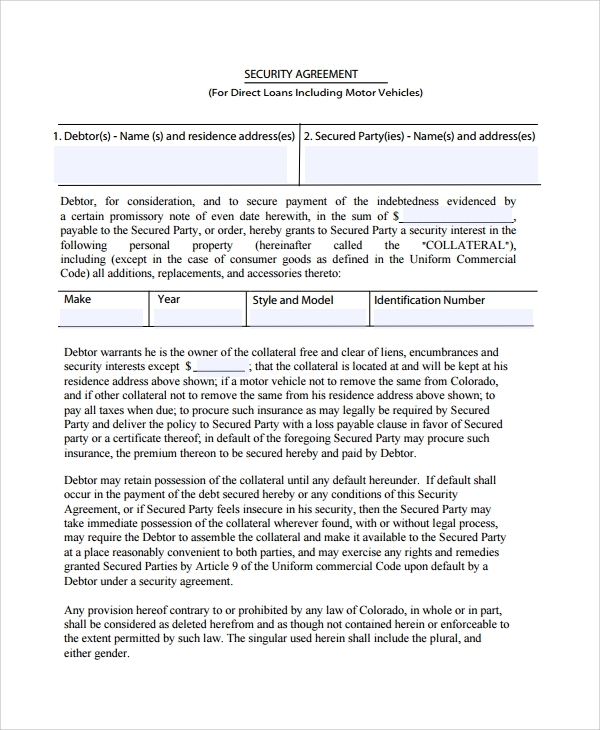 When you are renting or leasing a commercial property, and you are presenting something as the security such that in case you fail to pay for the rent or lease, your guarantor takes the charge, or it may be collected by liquidating your asset which you entitle as the security, is actually legally noted and brought down into a neat contract in details in as a commercial Security Agreement. These are highly important formats, and help you avoid legal complications once made in detail while renting or leasing any property. 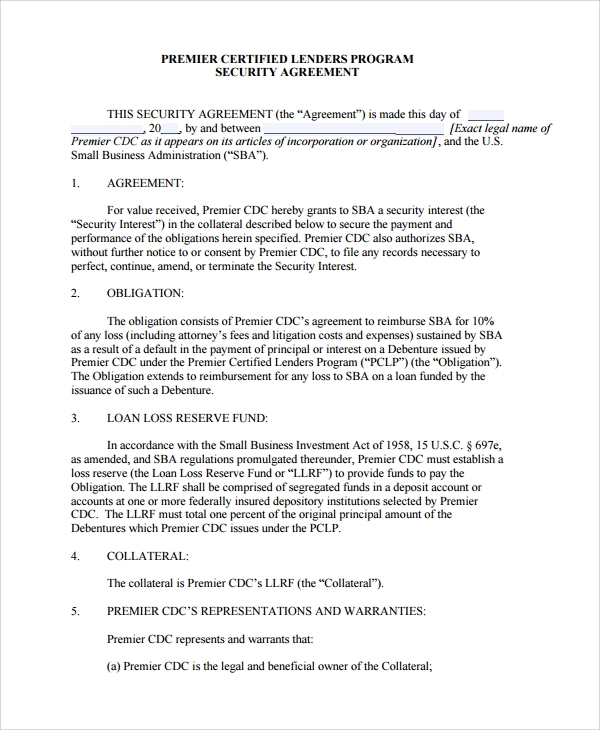 The commercial loan security agreement sample is a security deal or contract example showing how a deal is closed between the lender and borrower. When the borrower is taking a commercial purpose loan, and adds something as the security for the loan, then that is specified in details on this agreement. The template gives a complete idea of how to make this without any external reference. This contract or agreement is to state the security deposit which the borrower gives while the processing of a commercial lease. 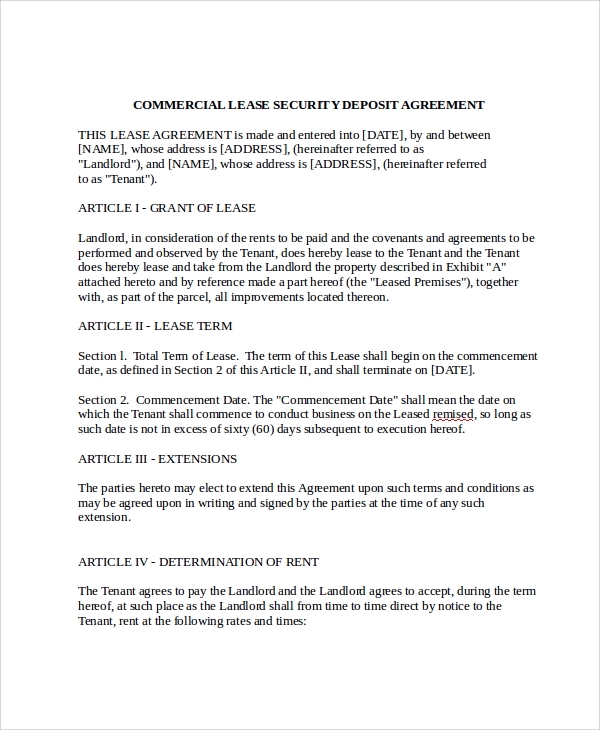 When you are taking any premises on lease for commercial usage, you pay security money, and this must be noted with full details in the agreement to avoid later confusions. The commercial security agreement for direct loans is a legal format where the borrower, taking a direct loan from a lender, and having no other medium in between gets into this agreement and makes things clear in written. This is to protect the rights of both parties as this is a direct loan. What are Commercial Security Agreements for? Commercial security is a much needed one when you are getting into any sort of materialistic or money related transaction with someone for a period. This may be about renting or leasing some property for commercial use, or may be about getting a loan from one for commercial use etc. In any such case the transaction of money from either parties as loan, Sample Security Agreement deposit, lease etc must be noted in legal papers and must be registered. 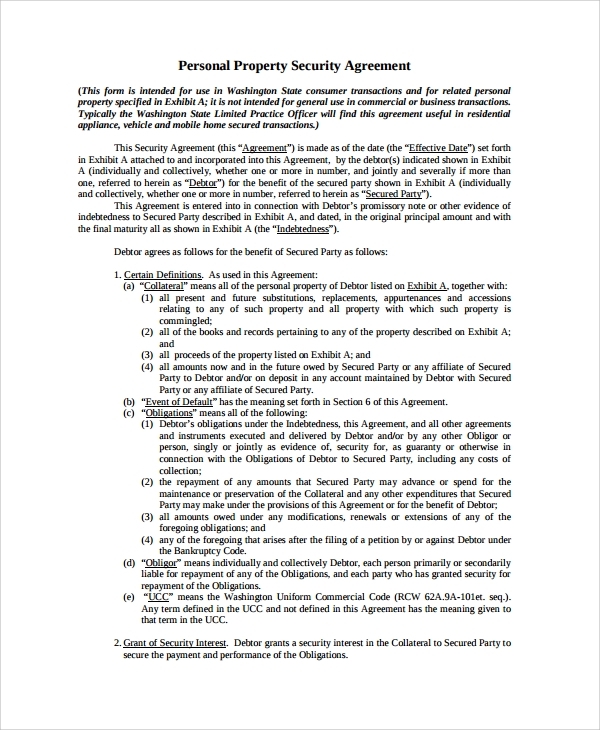 Hence the requirement for a commercial security agreement which secures rights of both borrower and lender came up, and these are now available as examples or template formats online for easy paperwork. What is the Importance of Commercial Security Agreements? Commercial security is a much needed thing whenever you are getting into money related or property related relation with another party. In case either party fails to abide by any of the discussed terms, they should get a chance to take action to resolve. 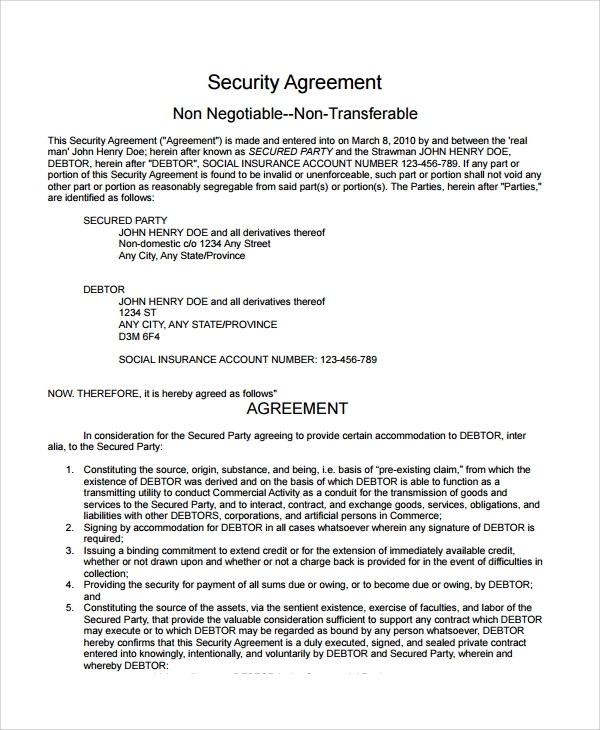 To keep a proof of the contract between the two, the security agreement plays a huge role. It helps resolve conflicts and is a big security for the security deposit, portion rented or amount of lease determination. 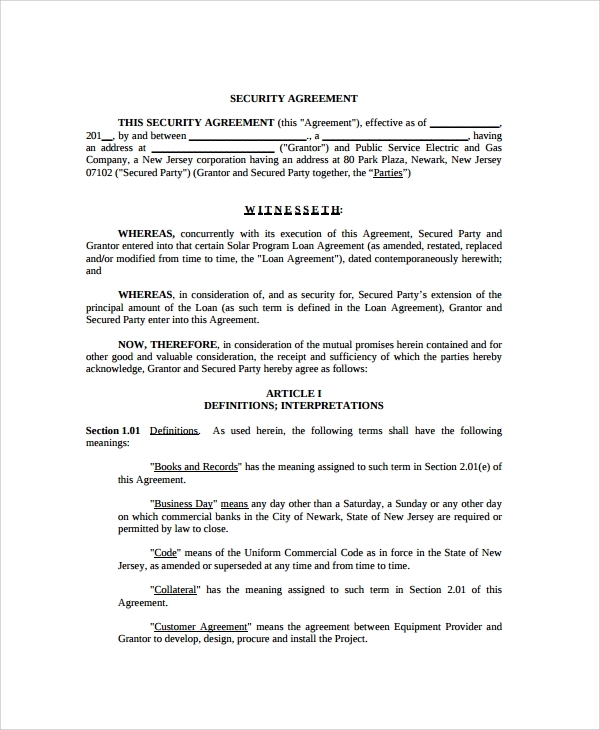 How to use the Commercial Security Agreement Templates? 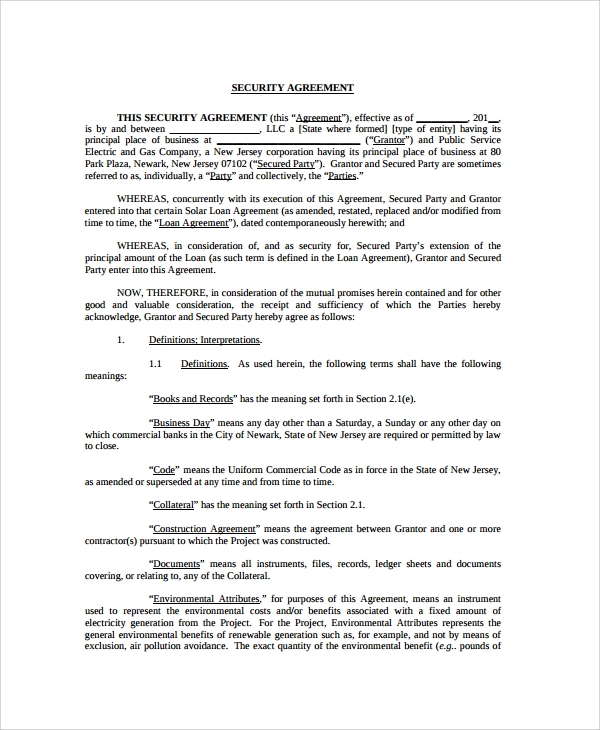 In order to use the commercial Security Agreement Templates, you have to plan it accordingly. 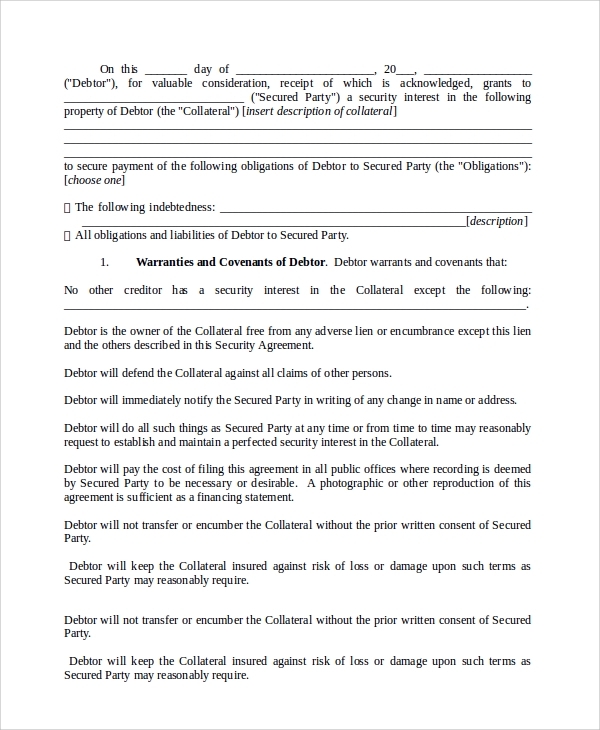 The usage is a real easy one as you simply need to download any agreement sample you like and which fits your needs, and then watch and make a similar agreement for your own where you mention your and the other party’s details. That is the simplest way you prepare the legal paper. You don’t need a lawyer unless you are going to register it. However a thorough research must be done to understand the exact format of agreement which you need. Whether you need a collateral security agreement or a loan security agreement, you would get all types free for use. Once you are secured by the commercial security agreement either as the party or as the financial lender, you actually have secured a pact. This is a security for the lender and helps recover the loan amount in case the borrower turns a defaulter.